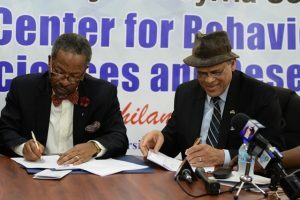 The name Jay and Sylvia Sobhraj Centre for Behavioral Studies and Research Centre will soon be emblazoned on a state-of-the-art facility at the University of Guyana’s Turkeyen campus. Jay Sobhraj, a Guyanese-born United States based philanthropist, has pumped a significant grant of GY$$80 million to establish the state-of-the-art behavioural study, research and multi-purpose centre in place of the old canteen building. The facility will house a bookstore, food court, model counselling centre, student gym and prayer rooms. It will also have an extended Medex Station and cater to various programmes including psychology, social work, criminology and psychiatry. The funding is being provided through the Jay and Sylvia Sobhraj Foundation. Jay Sobhraj, one of the founders of the charitable organisation said his education was made possible through grants and he is grateful that he is now in a position to give back to his homeland. “We have to take care of our motherland,” Sobhraj was quoted by government’s Department of Public Information as saying. An enthusiastic and deeply grateful Vice Chancellor Prof. Ivelaw Griffith said that discussions had been ongoing for a year. “This is not only a signally important milestone along rebranding and rebuilding, but it testifies to our recognition of the essential purpose of our being to enhance the ability of our students to come in and get experience,” Prof. Griffith, said. 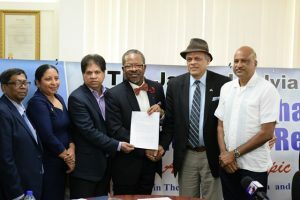 The University of Guyana’s Vice Chancellor Professor Ivelaw Griffith flanked by Nardeo Singh and Jay Sobraj (left to right), with other executives including Retired Police Commissioner Seelall Persaud at extreme right. “Philanthropy requires cultivation and time,” the VC pointed out, as he expressed gratitude to the foundation for making such a significant contribution to UG developing and expanding its curriculum. The Centre will provide a location for the new psychology programme which the University will start in March 2018 and which is being funded by United Nations International Children’s Fund (UNICEF). The new research facility will complement the mental health department which was established by the Ministry of Public Health. The department is currently training Mental Health Practitioners to work with mentally challenged persons. Over 100 such practitioners have been trained to date.